The work on this task was finished between 1st and 4th of January. With the release of 0.0.13 it is considered complete. There are some changes related to this task in trunk. Parts of the original idea for the design are deprecated, since they are not working well on all websites. Deprecating style attributes might not work because of rules marked as !important (all). Such syntax is needed to overcome the website design for sure. For example it will not work for "display: none !important;" or "display: none;" properties when "display: block !important" is used in another class for the same element. I'm nowhere near the start of the proposed additional changes. Lack of time with all the GNOME translations for the Bulgarian team. Will try to find some time for this task and the bugs section. As discussed over Jabber with Anton, there are few more changes needed on my side, after which he will make some visual improvements and changes. The time slider/progress bar should be changed, so that its height is reduced after some time. On mouse over/move the height of the bar should be increased again. Just like in YouTube. The changes were introduced in revision 310, 311 and 312. The clips bellow   are a little demo of the new interface in action. The interface should be changed to improve usability. YouTube's layout (all at the bottom bar) seems practical. The upgrade notification should be rendered outside the video interface when there are no objects detected. The debug log should be rendered outside the video interface. See also task #12177. It is probably a good idea to render the about dialog outside the video interface as well. The button with the logo that opens the about dialog should have the current version as a tooltip. 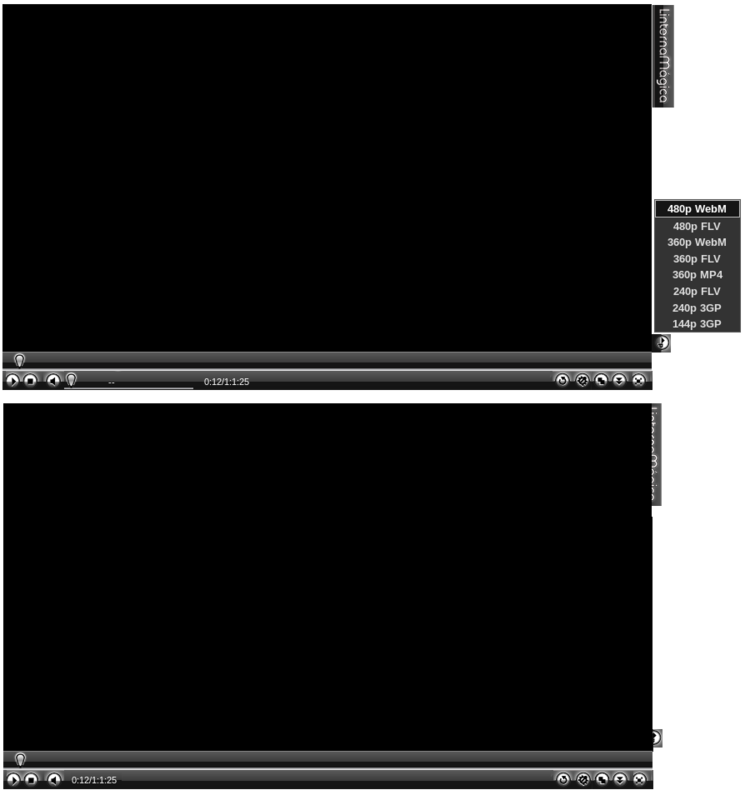 The HD links button must be outside the controls, so it could be rendered when the buttons of Linterna Mágica are stopped and the ones of the video plugin are used.